In 1882 the government offered a grant to the first company to establish a local sugar refinery. This was given to New Zealand Sugar Company, which established a plant beside Duck Creek in Birkenhead. The name Chelsea was chosen by the refinery’s first customs officer, who named it after the London suburb. 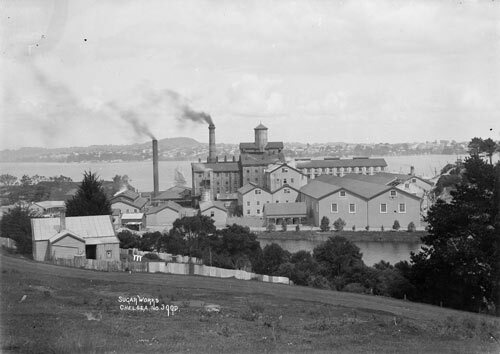 This early 1900s view shows the northern side of the works, with Auckland in the background. The factory is still in production. Painted in pink, it remains a striking landmark.